Asian eggplants are long, slender, with thin edible skin, and a sweet creamy flesh. 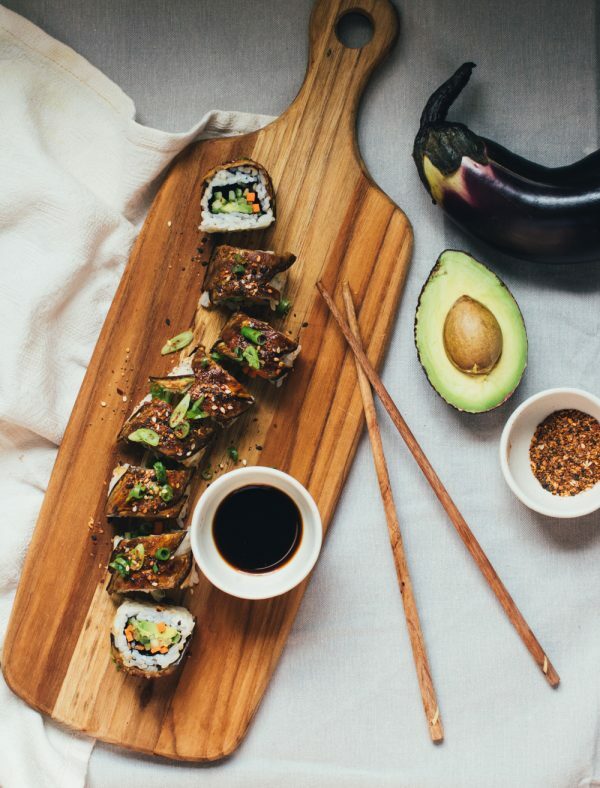 This recipe, a play on a black dragon sushi roll, features Asian eggplant as the star ingredient. 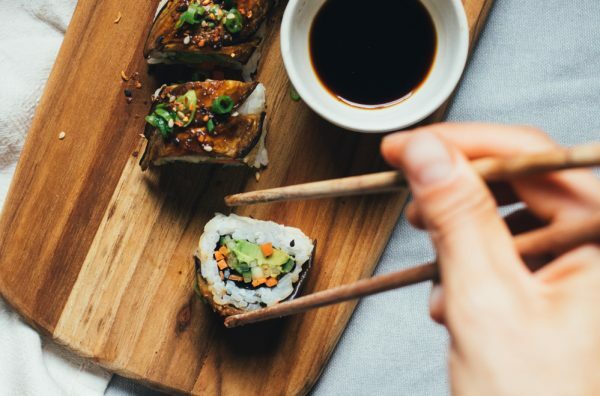 The eggplant, brushed with a sweet miso dressing and roasted in the oven, lends a delicious burst of flavour and luxurious meaty texture to a vegetarian sushi roll. Whisk together the miso, ginger, and soy sauce into a smooth paste, then add in the remaining marinade ingredients and whisk until combined. 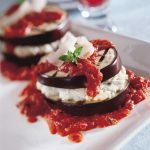 Slice the eggplants into even 1cm long slices (a mandoline slicer is helpful). You should have about 8 good slices, not including the ends. 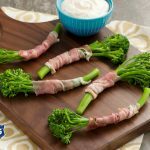 Arrange them on a large parchment-lined baking sheet and generously brush with marinade on both sides. 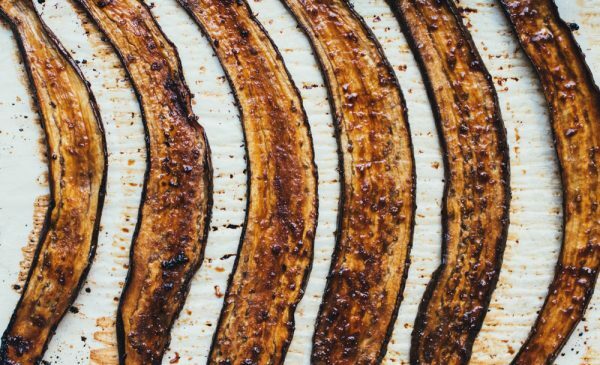 Roast them for 15 minutes, flip, and roast for 10 - 15 more minutes, or until the eggplants are soft and starting to caramelize around the edges. While the eggplants are roasting, cook the sushi rice. Rinse the sushi rice for about 1 - 2 minutes in room temperature water, until the water runs clear. Add 1.25 cups (310 mL) of water to the rice in a medium sized pot and bring to a boil over high heat. Reduce heat to low, cover, and simmer for about 8 - 10 minutes, or until all of the water has been absorbed. Turn off heat and let the rice rest until the eggplants finish cooking. Combine the rice vinegar, salt, and sugar in a small pot and bring to a simmer. Cook until all of the sugar and salt has dissolved. Add half of the rice seasoning to the hot rice, gently folding it in. 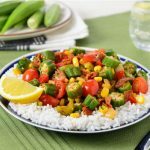 Taste a few grains of rice and continue to add more seasoning until you’re happy with how it tastes (you may not use all of it). Slice the middle eggplant pieces diagonally into bite-sized diamond-shaped slices. The end pieces are delicious, but won’t look as nice on the dragon rolls. Eat them or reserve them for something else. Trim off 1/4 of the nori sheets (you only need 3/4 to make the rolls). Double-wrap a sushi mat with plastic cling wrap (this helps tremendously with the sticking) and place a nori sheet on top. Keeping your hands moist while handling the rice (I keep a bowl of water nearby), place 1/4 of the rice into the middle of the first nori sheet and spread it out until it reaches the ends. 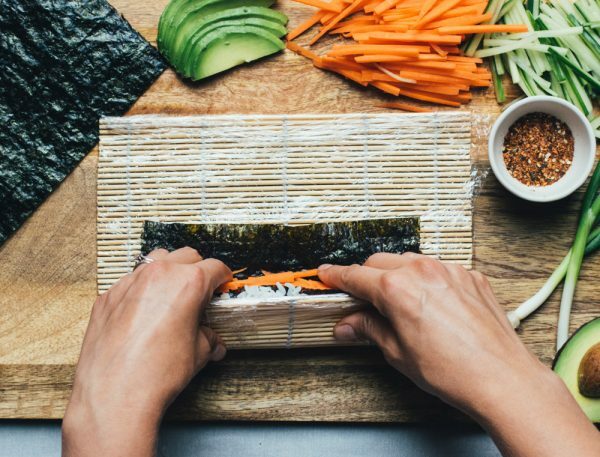 Flip it over, then position avocado slices across the middle, followed by a small amount of cucumber and carrot pieces (it may take a little bit of practice to get the quantities right) directly on the nori (the rice will be on the outside of the roll). Using your fingers to contain the filling, lift up the base of the sushi mat and use it to fold the bottom of the nori sheet over the fillings, keeping it as tight as you can. Tuck in any ingredients that try to escape. Fold it over once more and you should have completed your roll. Use the sushi mat to shape it and make sure that it’s tight. 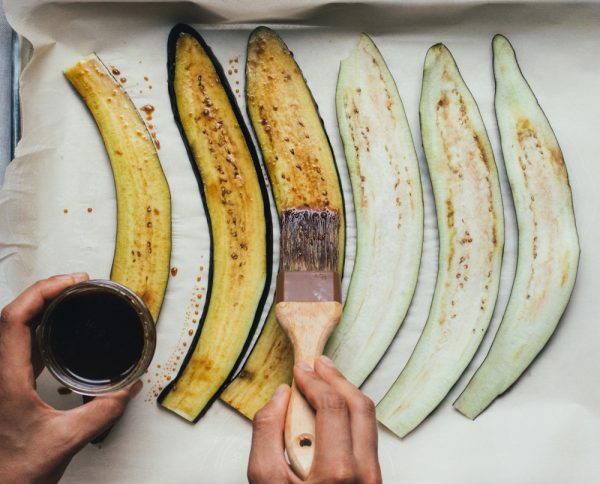 Arrange the eggplant slices on top and hug the roll with the sushi mat making sure that they are flush with the outside of the roll (the sticky marinade will help them stay in place) and transfer the roll to a cutting board (use a little water on the base to keep it from sticking). Repeat the rolling process with the remaining rolls. Once the rolls are completed, you’re ready to slice and serve them. Splash some water along the edge of a really sharp knife and cut each roll into 8 pieces. Some of the eggplant slices may try to come off, but you can use the sushi mat to hug the roll again and tighten up the arrangement as you go. Brush each roll with a little bit more of the marinade, sprinkle with sliced scallions and shichimi togarashi (or sesame seeds). Serve right away with soy sauce or tamari.